There are many roads to the top of a mountain, and likewise–there are many paths to perfection and mastery of the martial arts. One of the most underused and misused of these paths is the Martial Arts Alliance or Organization. Sadly, the ones misuing this institution are the most knowledgeable of the martial arts community: The Martial Arts School Owner. The association of martial artists can range from your typical backyard sparring group to an alliance made up of martial arts schools to a federation of schools within the same system. There are many benefits to connecting and networking with other teachers, masters and differing systems–and none involve politics and rank. CREDIBILITY. You trust a master to give you truth. But one thing with these alliances you will never find is truth. Teachers will attest to the knowledge and ability of another teacher simply because they like each other, and not because they truly believe that teacher is who you say he is. Anything that goes with it is then questionable–from encouraging your students to give him seminar money, to practicing his art, to giving a reference to a potential student of his. Put plainly, it is dishonest. SELFISHNESS. Almost everyone participating is doing so for selfish reasons. One guy does it to surround himself with a crew who protects him. Another does it for rank because he’s made his own style. Another sees income potential. Another wants a reputation. Very few do it for love of the art or to improve his community. Martial arts alliances can enhance your martial arts experience. My favorite use of the alliance is to have a circle of competitors you can bounce ideas off of, provide sparring partners for yourself and your students, to further your learning (rather than rank or pad a resume). The alliance can put you in the company of other philosophies, give you true friendships where you share information and learn from each other–even provide you with rivalries who will make you stronger and sharper. Some of the best martial artists we know have derived their greatness from alliances. Few know this, but well known FMA master Billy Bryant’s martial arts genius originated from alliances he made in the 1980s upon relocating from New York City to Washington, DC. When he came, we knew him as “Jabba”, and he was a Kenpo and Tae Kwon Do Black Belt. While in DC, he boxed, learned Kung Fu, Jujitsu, and FMAs. For some, he actually became a student of these men. For others, he traded his knowledge for theirs. And for a select few–he held sparring sessions so that he could spy on the best fighters and learn to beat them. For those who wanted that juice he had–we taught him our arts in exchange for his point fighting ability. It was a win-win. His greatness rubbed off on many who I see did not credit him. But likewise, he did not always give the origins of his knowledge. Often, he did not have permission to name their arts, but utilized the knowledge they shared with him. 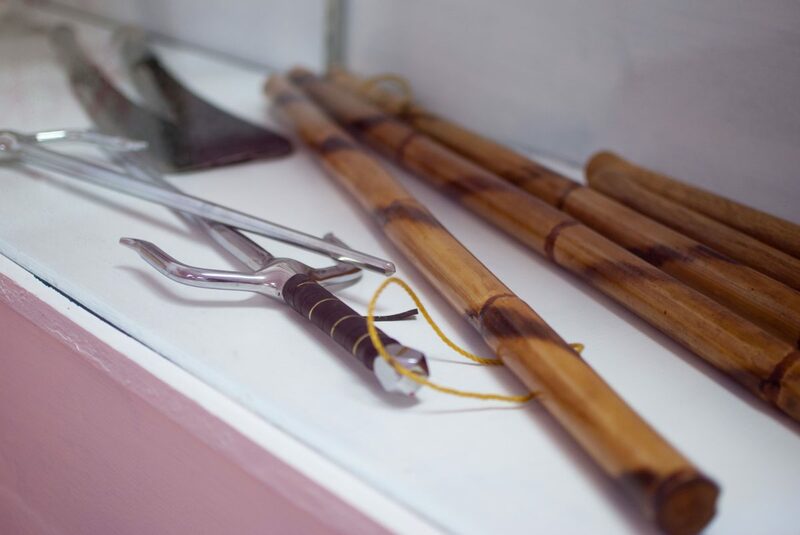 If you ever heard Billy talk about Saguisabal Visayan Eskrima or Kuntao–it’s me. Saguisabal is my grandmother’s maiden name, and I exchanged my system to learn to point fight from him. If you saw him do a Kung Fu form–again, that’s either me or Master Raymond Wong–in exchange for teaching Sifu Wong’s nephews to point fight. Billy was the perfect example of what can be done with martial arts alliances, as he took what he exchanged and often did it better than the person who taught him. To this day, I still don’t know who his teachers are. But I know that he was an excellent lifelong martial artist. PURCHASING POWER. One school may only need $200 a month worth of martial arts equipment and supplies. But imagine if 6 schools pooled their purchasing power to demand a larger discount from suppliers. LEARNING. Teachers holding group workouts among themselves to share information. This information can be brought back to the home school to figure out how to incorporate those techniques–or beat them. TOURNAMENTS. We support each other’s tournaments, but we also tap into each other’s strengths to provide our students with a steady stream of opponents that we know won’t try and hurt them–or we can demand that they pull out their best effort to beat our guys. However, I am not in favor of excuding non-members. The more unfamiliar opponents, the better. You don’t want a federation’s tournaments known as a particular style’s tournament. This should be for everyone. TESTING. If you’re going to promote, why not bring other teachers to give their HONEST opinion about if your students deserve their rank or not? Those teachers can bring their own best students to prove yes or no. This way, if a student is testing, he really doesn’t know if he will pass or fail. Rank, then, is truly earned. And properly vouched for. BUSINESS KNOWLEDGE. In every group of teachers, there is always one or two guys making a killing with their martial arts, and there are some who work side jobs while teaching because they are struggling. A true alliance with equality will have those with more knowledge sharing information and even resources with those who have less. What good is a martial arts community if most of the teachers can’t keep their doors open? RESPECT. Real respect for the martial arts comes when teachers of the martial arts respect each other. Too often, I see teachers right up the street from each other who have never met, dislike each other, bad mouth each other, or know nothing about each other. But if you have a community of teachers who all excel, have a mutual respect for one another, and help each other keep food on the table–martial arts in that community will be respected by all. I had such a relationship with a few teachers in my area, and if one of their students came to me–I sent him back to his teacher. I only took a student if his teacher were okay with it, and he agreed not to quit. If a student was no longer attending that school, I encouraged them to go back first. As a result, you will find many of my students who are doing Wing Chun and Eskrima, Tang Soo Do and Eskrima, BJJ and Eskrima. If you spread a 50 gallon drum of water in a parking lot, the water will quickly evaporate and disappear within a day or two. But if you keep all that water in the 50 gallon drum–it will remain for years if you keep it together. When martial artists complain that traditional masters have lost ground to the MMA gyms, this is the reason why. We are spread all over the place, doing our own thing, and not caring if every other teacher is putting food on the table. That’s not what this art was ever about. Yes we are fighter warriors. But we are community minded leaders, who use this art to help others and keep them alive. How about joining with others who have the same goal and moving forward as a true brotherhood? There is an African proverb that says if you want to travel quickly, go alone–but if you want to go far, travel together. Something to think about. As I said, this only one approach to the road up the martial arts mountain. Many great masters and fighters did it in isolation as well. Kyokushinkai founder Masutatsu Oyama comes to mind. But even when he had perfected his art–he joined hands with other Japanese masters, some who even disliked him, and built a worldwide reputation for Japanese Karate that stands to this day. Perhaps we will talk about that method soon.